Three men have been taken to hospital following a serious collision which has closed the Foreglen Road near Claudy. The collision was reported at 4.05pm. 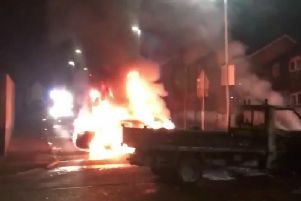 A PSNI spokesperson said: “The condition of one of the men, a passenger in the Mazda car involved, is believed to be extremely serious. “The other two men, the drivers of the Mazda and the second vehicle a Mercedes van, are not believed to have sustained any life threatening injuries. “The Foreglen Road remains closed at present.